Summary: The manufacturer’s description and specs, and the average user rating for the Smith & Wesson Engraved Model 3 Schofield revolver. 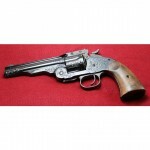 Smith & Wesson’s Engraved Model 3 Schofield is a six-round revolver chambered in .45 SW and built with carbon steel. Sporting a blue finish, this pistol features a walnut grip, a half-moon post front sight, a fixed notch rear sight, a top-break frame, a color case hardened hammer, and a .312 smooth trigger. This entry was posted in .45 SW, $4,001-$4,500, Full size, Revolver, Smith & Wesson on June 22, 2010 by Staff.